37059 tnt 37605 6C51 1258 Sellafield B.N.F. - Heysham Harbour P.S. 37603 + 37604 6C53 0630 Crewe Coal Sidings (Drs) - Sellafield B.N.F. 37608 tnt 37611 1Q01 0010 Peterborough L.I.P. - London Kings Cross - March Down R.S. 1Q01 2259 March Down R.S. - Ely Dock Jn - Peterborough Eastfield Jn - March Down R.S. 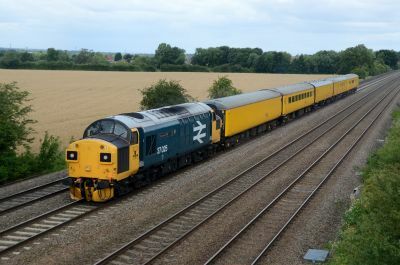 37608 tnt 37611 1Z23 1830 Derby R.T.C. 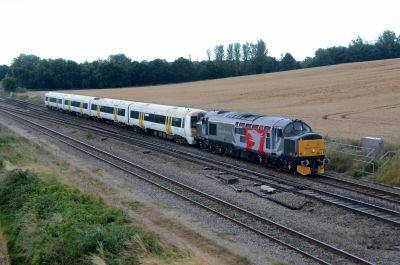 (Network Rail) - Peterborough L.I.P. 37716 3Q40 1914 Derby R.T.C. (Network Rail) - Hanwell Bridge Loop - London Paddington - Kennington Goods Loop - Old Oak Common H.S.T.D. 37800 5Q58 0440 Derby Litchurch Lane - Ramsgate E.M.U.D. 37059 + 37605 6C53 0630 Crewe Coal Sidings (Drs) - Sellafield B.N.F. 37218 + 37688 6K40 0610 Georgemas Junction - Mossend Down Yard Between Georgemas Junction - Inverness T.C. 37254 3Q40 1954 Hither Green P.A.D. - London Bridge - Paddock Wood - London Charing Cross - Dartford - Battersea Loop - Hither Green P.A.D. 37069 tnt 37259 6C51 1258 Sellafield B.N.F. - Heysham Harbour P.S. 37254 3Z13 1106 Woking - Hither Green P.A.D. 3Q13 2327 Hither Green P.A.D. - Sheerness-on-sea - Dover Priory - Swale - Hither Green P.A.D. 37601 3Q69 2146 London Euston - Rugby - Bletchley Up&Down Relief - Rugby - Milton Keynes Central - Rugby C.S. 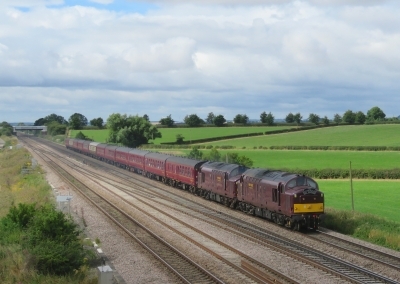 37800 + 37884 0T37 1230 Burton Ot Wetmore Sidings - Leicester L.I.P. 37254 3Z08 1600 Eastleigh East Yard - Hither Green P.A.D. 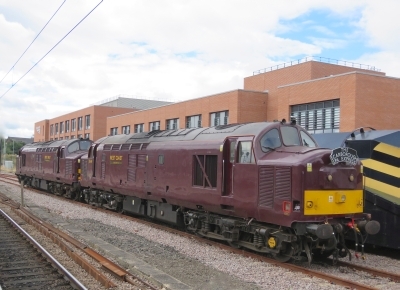 37884 0O58 0900 Leicester L.I.P. - Ramsgate E.M.U.D. 68017 + 37409 + 37059 0K27 1443 Carlisle N.Y. - Crewe Bas Hall S.S.M. 37606 + 37610 6C53 0630 Crewe Coal Sidings (Drs) - Sellafield B.N.F. 37608 tnt 37611 1Q99 1623 Cambridge T.&R.S.M.D. - Kings Lynn - Ipswich - Norwich - Colchester Goods Loop - Felixstowe Creek R.S - Mistley - Peterborough L.I.P. 5Z02 1630 Colchester Up Passngr Loop - Stowmarket D.G.L. 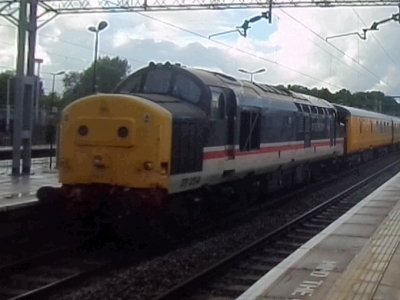 37608 tnt 37611 1Q98 1400 Cambridge T.&R.S.M.D. - Norwich - Great Yarmouth - Norwich - Great Yarmouth - Norwich - Lowestoft - Claydon - Lowestoft - Norwich - Ely North Jn - Cambridge T.&R.S.M.D. 37608 tnt 37611 1Q97 0931 Ferme Park Recp. - Barking Upney Junction - Gas Factory Loop - Grays - London Liverpool Street - Harwich Town - Chelmsford D.G.L - Clacton-on-sea - London Liverpool Street - Southend Victoria - Shenfield - London Liverpool Street - Cambridge T.&R.S.M.D. 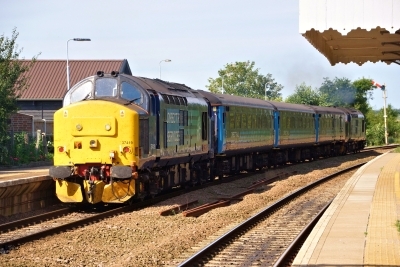 37422 0Z37 1600 Carlisle Kingmoor Sdg(Drs) - Barrow C.S. 37605 0V73 0433 Crewe Coal Sidings (Drs) - Berkeley C.E.G.B. 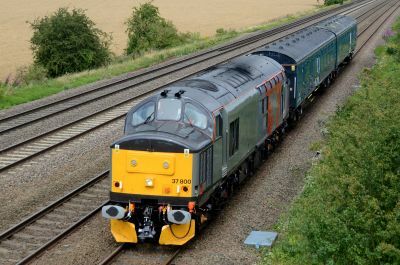 37254 3Z03 1014 Derby R.T.C. (Network Rail) - Hither Green P.A.D. 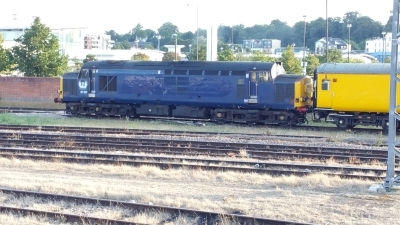 57007 tnt 37422 5Z01 0741 Norwich C.Pt. T.&R.S.M.D - Ilford E.M.U.D. 66423 + 37605 6K27 1443 Carlisle N.Y. - Crewe Bas Hall S.S.M. 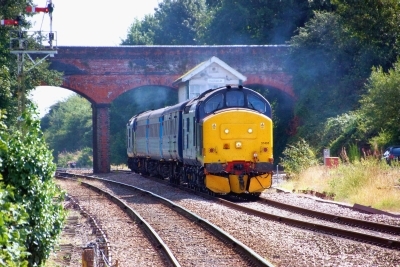 37608 tnt 37611 1Q90 1532 Derby R.T.C. (Network Rail) - Audley End - Cambridge - London Liverpool Street - Hertford East - London Liverpool Street - Chingford - Enfield Town - Ferme Park Recp. 37025 3Q15 2030 Hither Green P.A.D. - London Victoria - Haywards Heath - London Victoria - Hither Green P.A.D. 37025 3Q22 2030 Hither Green P.A.D. - London Victoria - Haywards Heath - London Victoria - Hither Green P.A.D. 37218 + 37688 6K45 0610 Georgemas Junction - Mossend Down Yard Between Georgemas Junction - Inverness T.C. 37612 + 37716 6C53 0630 Crewe Coal Sidings (Drs) - Sellafield B.N.F. 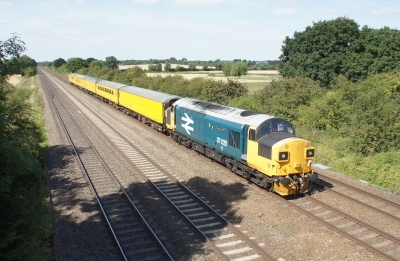 37219 tnt 37254 3Z06 1052 Derby R.T.C. (Network Rail) - Tyseley L.M.D. 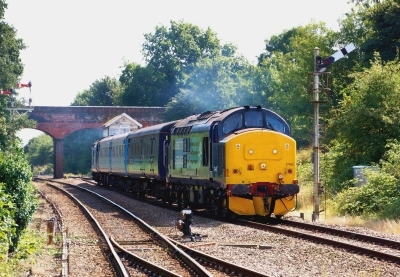 37611 3Z61 1500 Derby R.T.C. 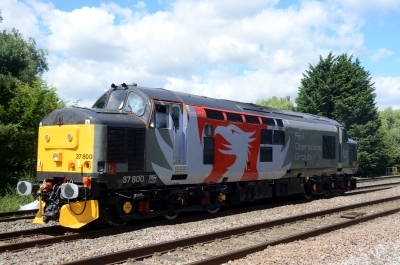 (Network Rail) - Peterborough L.I.P. 37025 3Z03 1014 Derby R.T.C. (Network Rail) - Hither Green P.A.D. 37800 5M37 1055 Derby St Andrews Economac - Leicester L.I.P. 37516 5Z47 0506 Leeds Balm Rd Loco (Fhh) - Fort William J.Yd T.C. 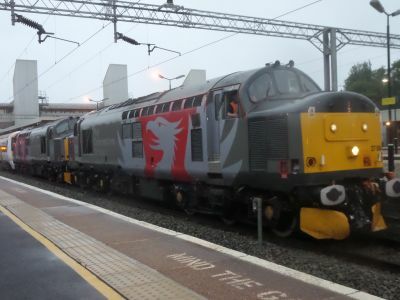 37800 + 47843 + 47847 + 47848 0M37 1010 Derby - Leicester L.I.P. 37175 3Q46 2207 Hither Green P.A.D. - London Victoria - Sevenoaks - New Cross - Sevenoaks - London Victoria - Dartford - London Charing Cross - Hither Green P.A.D. 37175 3Q45 2302 Hither Green P.A.D. - London Victoria - Ramsgate - London Victoria - Hither Green P.A.D. 37609 + 37716 6C53 0630 Crewe Coal Sidings (Drs) - Sellafield B.N.F. 37800 0Z73 0913 Derby St Andrews Economac - Kidderminster S.V.R. 37057 3Q39 1914 Derby R.T.C. 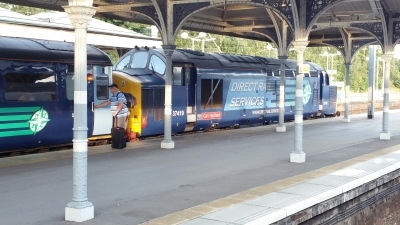 (Network Rail) - Reading - London Paddington - Southall T.C. - Ferme Park Recp. 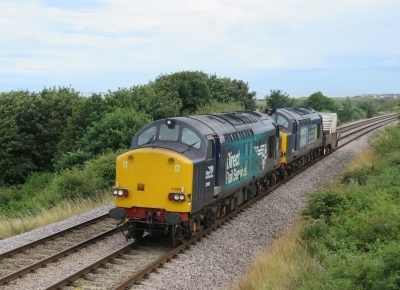 37409 5Z41 0903 Carlisle Kingmoor Sidings (DRS) - Carnforth - Barrow C.S.